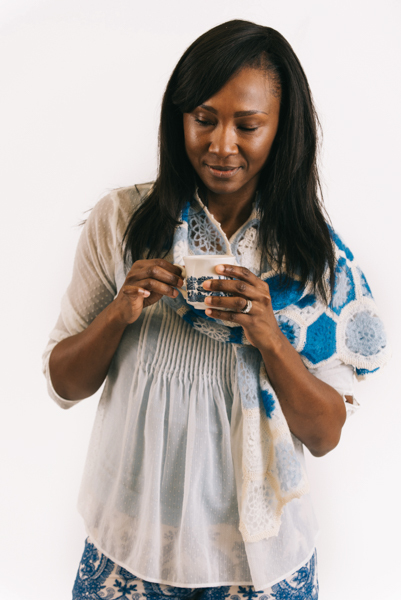 The scarf is inspired by the theme of China Blue. The China’s blue and white porcelain is an oriental traditional art. 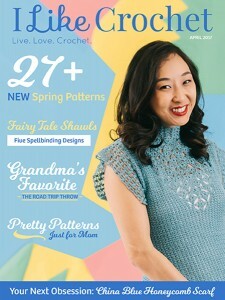 But when it comes with mohair crocheted motif, it has some modern feel. 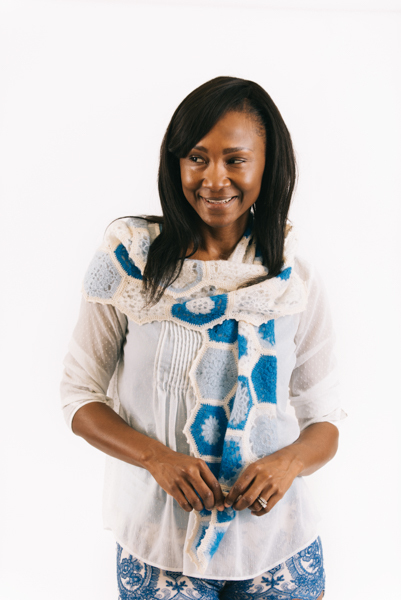 The scarf is formed with 45 crocheted honeycomb motifs. Size: 11½” / [29 cm] wide x 64” / [162 cm] long. Gauge: 1 honeycomb motif = about 4” [10 cm] across. Cloud Excellent Mohair (66% Super Kid Mohair, 34% Nylon; 219 yards [200 meters]/20 grams): #47 Dark Blue, 1 ball; #35 Light Blue, 1 ball; #01 White, 1 ball. 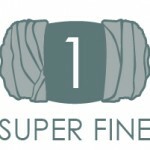 Willow Yarns™ Stream (70% Superwash Wool, 30% Silk; 437 yards [400 meters]/50 grams): #0001 Natural, 1 ball. Hook: US size C (2.5 mm). sc-4-ch-3 p: (sc-4-chain-3 picot): sc between each st 4 times, ch 3, sc in same sp of last sc made. 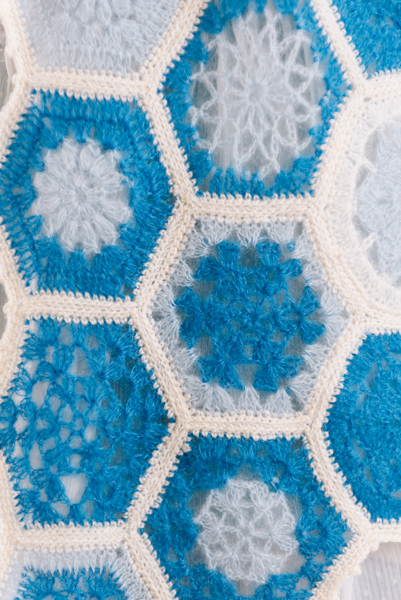 There are 4 types of honeycomb motif designs and each honeycomb motif is crocheted with kid mohair yarn in the colors of blue, light blue, and/or white. 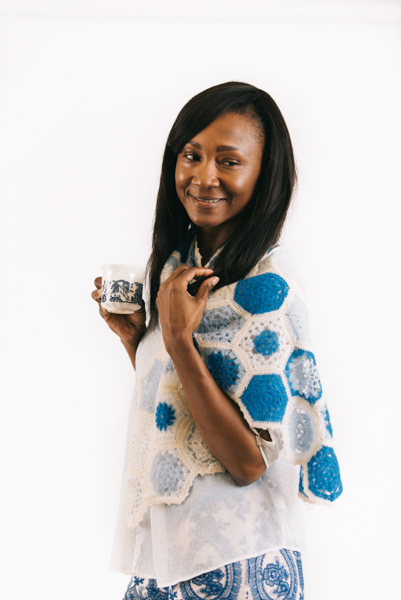 The edges of each honeycomb motif are crocheted with lace weight yarn in the color of white. 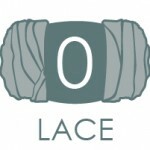 The edged of the scarf is crocheted with simple crochet stitches. 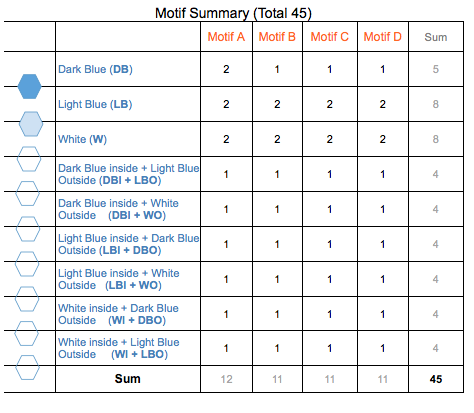 The number of honeycomb motifs in each motif design and in each color is summarized in the Motif Summary Table. 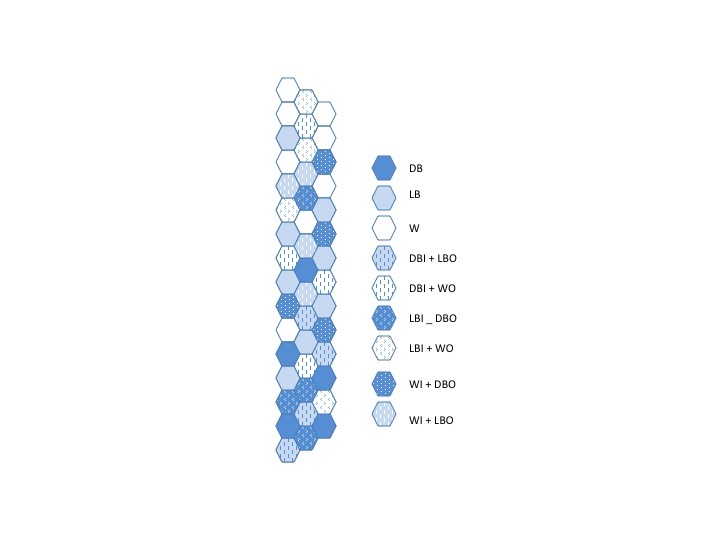 The honeycomb motifs are arranged randomly but follow the general pattern of from the darker on one side of the scarf to the lighter on other side. The sample scarf is designed as shown in the Motif Arrangement drawing. Rnd 1: Ch 3 (counts as dc), dc in ring, *ch 2, 2 dc in ring; rep from * 4 more times, ch 2, sl st in first dc to join – 12 dc, 6 ch-2 sps. Rnd 2: Ch 3 (counts as dc), *dc in next dc, (2 dc, ch 2, 2 dc) in next ch-2 sp, dc in next dc; rep from * 4 more times, dc in next dc, (2 dc, ch 2, 2 dc) in next ch-2 sp, sl st in first dc to join – 36 dc, 6 ch-2 sps. Rnd 3: Ch 1, sc in next dc, *(3 dc, ch 2, 3 dc) in next ch-2 sp, sc in space between next 3rd and 4th dc; rep from * 4 more times, (3 dc, ch 2, 3 dc) in next ch-2 sp, sl st in first sc to join – 36 dc, 6 ch-2 sps. Rnd 4: Ch 6 (counts as dc and ch 3), *(sc, ch 2, sc) in next ch-2 sp, ch 3, dc in next sc, ch 3; rep from * 4 more times, (sc, ch-2, sc) in next ch-2 sp, ch 3, sl st in first dc to join – 12 ch-3 sps, 6 ch-2 sps. Rnd 5: Ch 3 (counts as dc), *4 dc in next ch-3 sp, (dc, ch 2, dc) in next ch-2 sps, 4 dc in next ch-3 sp, dc in next dc; rep from * 4 more times, 4 dc in next ch-3 sp, (dc, ch 2, dc) in next ch-2 sps, 4 dc in next ch-3 sp, sl st in first dc to join – 66 dc, 6 ch-2 sps. Rnd 1: Ch 3 (counts as dc), 11 dc in ring, sl st in first dc to join – 12 dc. Rnd 2: Ch 3 (counts as dc), 3-dc cl in same dc as last joining, ch 2, *4-dc cl in next dc, ch 2; rep from * 10 more times, sl st in first dc to join – 12 4-dc cl; 12 ch-2 sps. Rnd 3: Sc in next ch-2 sp, ch 3 (counts as dc), 2 dc in same ch-2 sp, *(3 dc, ch 2, 3 dc) in next ch-2 sp, 3 dc in next ch-2 sp; rep from * 4 more times, (3 dc, ch 2, 3 dc) in next ch-2 sp, sl st in first dc to join – 54 dc; 6 ch-2 sps. Rnd 4: Ch 3 (counts as dc), dc in next 5 dc, *(dc, ch 2, dc) in next ch-2 sp, dc in next 9 dc; rep from * 4 more times, (dc, ch 2, dc) in next ch-2 sp, dc in next 3 dc, sl st in first dc to join – 66 dc, 6 ch-2 sps. Rnd 1: Ch 5 (counts as dc and ch 2), *dc in ring, ch 2; rep from * 10 more times, sl st in first dc to join – 12 ch-2 sps. Rnd 2: Ch 1, sc in next ch-2 sp, *ch 6, sc in next ch-2 sp; rep from * 10 more times, ch 3, dc in first ch to join – 12 ch-6 sps. Rnd 3: Ch 1, sc in same ch-6 sp, *ch 6, sc in next ch-6 sp; rep from * 10 more times, ch 3, dc in first ch to join – 12 ch-6 sps. Rnd 4: Ch 3 (counts as dc), 2 dc in same ch-6 sp, *(4 dc, ch 2, 4 dc) in next ch-6 sp, 3 dc in next ch-6 sp; rep from * 4 more times, (4 dc, ch 2, 4 dc) in next ch-6 sp, sl st in first dc to join – 66 dc, 6 ch-2 sps. Fasten off. Rnd 1: Ch 6 (counts as dc and ch 3), *dc in ring, ch 3; rep from * 4 more times, sl st in first dc to join – 6 ch-3 sps. Rnd 2: Ch 5 (counts as dc and ch 2), 2 dc in same dc as last joining, *ch 1, (2 dc, ch 2, 2 dc) in next dc; rep from * 4 more times, ch 1, dc in same dc as last joining, sl st in first dc to join – 24 dc; 6 ch-2 sps. Rnd 3: Sl st in next ch-2 sp, ch 6 (counts as dc and ch 3), 3 dc in same ch-2 sp, *ch 2, (3 dc, ch 3, 3 dc) in next ch-2 sp; rep from * 4 more times, ch 2, 2 dc in first ch-2 sp, sl st in first dc to join – 36 dc; 6 ch-3 sps; 6 ch-2 sps. Rnd 4: Sl st in next ch-3 sp, ch 5 (counts as dc and ch 2), 4 dc in same ch-3 sp, *3 dc in next ch-2 sp, (4 dc, ch 2, 4 dc) in next ch-3 sp; rep from * 4 more times, 3 dc in next ch-2 sp, 3 dc in first ch-3 sp, sl st in first dc to join – 66 dc; 6 ch-2 sps. Fasten off. Rnd 1: Ch 1 (counts as sc) in any dc, sc in next dc around all edges, (sc, ch 2, sc) in ch-2 sps, sl st in first sc to join – 78 sc, 6 ch-2 sps. Rnd 2: Ch 1 (counts as sc), sc in next sc around edge, (sc, ch 1, sc) in ch-2 sps, sl st in first sc to join – 90 sc, 6 ch-1 sps. With the right side facing up, arrange all honeycomb motifs as desired and align them so that the edges to be joined are touching each other. Whip stitch the back loops of the edges together. Rnd 1: Ch 1 (counts as sc), sc in space between each st evenly around edges of Scarf, working 2 sc in ch-1 sps, sl st in first sc to join. Rnd 2: Ch 1 (counts as sc), sc-4-ch-3 p evenly around edges so that each corner has one ch-3 picot and 2 between corners, sl st in first sc to join. Weave in end and block.